Mike Rowe (2nd from L), a 2017 recipient and advisors. The mikeroweWORKS Foundation has contributed $50,000 to a SkillsUSA scholarship fund for students competing in the world's largest showcase of career and technical education at the 2018 National Leadership and Skills Conference in Louisville, Ky. This is the eighth consecutive year that the mikeroweWORKS Foundation has offered travel scholarships to SkillsUSA members who compete and place first in their state's SkillsUSA Championships but face a financial challenge in going on to the national event. The mikeroweWORKS Foundation focuses on students who are working primarily toward careers in manufacturing, construction, transportation, electronics and other program areas where a skills gap exists. 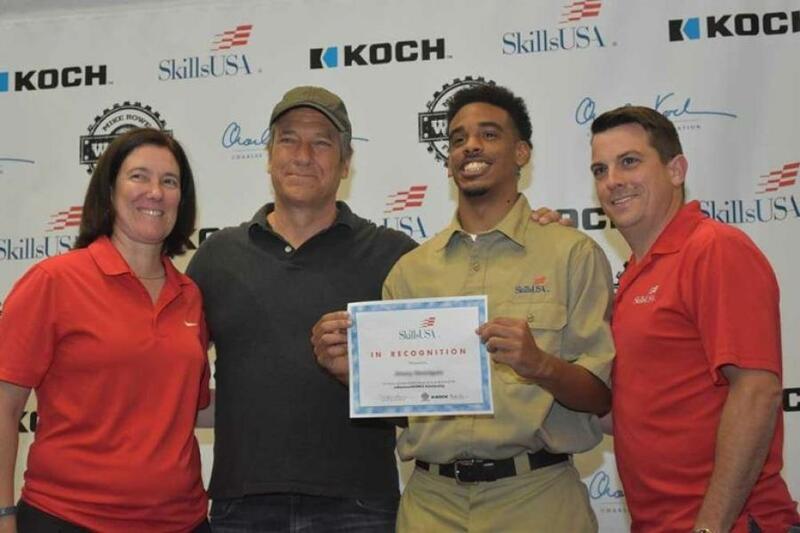 Since 2011, the mikeroweWORKS Foundation has provided scholarships to nearly 500 SkillsUSA students, representing an investment of more than $400,000 in America's future skilled workforce. The annual SkillsUSA Championships take place this June 26-29. An expected 7,000 competitors will be tested in more than 100 leadership and hands-on occupational skills contests, the majority of which are STEM-focused. Events are as diverse as humanoid robotics, automated manufacturing technology, carpentry, graphic communications, mobile electronics installation, information technology services and medical assisting. Competitions are planned and run by industry to its standards for entry-level workers. The mikeroweWORKS Foundation focuses on students ready to work hard, but who face financial challenges in attending the national event. Scholarships are based on a written application that includes financial need, SkillsUSA involvement, and the student's skills in specific trade areas where a skills shortage exists. Applicants also must provide a recommendation from a SkillsUSA member instructor or state association director. SkillsUSA is a vital solution to the growing U.S. skills gap. The nonprofit partnership of students, instructors and industry ensures America has the skilled workforce it needs to stay competitive. Endorsed by the U.S. Department of Education, the association serves more than 335,000 member students and instructors each year in middle schools, high schools and colleges. This diverse talent pipeline covers 130 trade, technical and skilled service occupations, the majority STEM-related. More than 600 corporations, trade associations, businesses and labor unions actively support SkillsUSA at the national level. SkillsUSA empowers its members to become world-class workers, leaders and responsible American citizens as it improves the quality of our nation's future skilled workforce. SkillsUSA supports its student members through the development of SkillsUSA Framework skills that include personal, workplace and technical skills grounded in academics. Local, state and national championships, designed and judged by industry, set relevant standards for career and technical education and provide recognition opportunities for students. SkillsUSA also offers technical skill assessments and workplace credentials through the SkillsUSA Career Essentials program, a cutting-edge solution that defines, implements and measures career readiness skills for students. The mikeroweWORKS Foundation is a 501(c)(3) public charity that works hard to debunk myths about the skilled trades and help close the skills gap. As the CEO of the foundation, Mike Rowe speaks regularly about the country's dysfunctional relationship with work and challenges the persistent belief that a four-year degree is automatically the best path for the most people. To achieve its mission, the foundation gives away a modest sum of money to people getting trained for skilled jobs that are in demand through a variety of scholarship programs, including the work ethic scholarship program. Since its inception, the foundation has granted, or helped facilitate the granting of, more than $5 million in technical and vocational education for trade schools across the country. For more information, visit SkillsUSA.org and mikeroweworks.org.